A rather sad title but lots of lovely things to report on. I took a week off work last week for my birthday and tried to cram in as many days out as I could and sample plenty of cakes. Sadly the week I chose to have off work was filled with downpours and I couldn't go camping like a planned but I still managed to have lots of fun. Last Sunday I went for a mammoth walk around Cardiff and picked up a tasty Indian breakfast at the Riverside market and headed towards Bute park for a relaxing afternoon. I've seen the NZ football team and Brazilian teams train in the park recently and saw the GB team leaving Cardiff after their defeat on the weekend :( Cardiff has been buzzing with Olympic fever this week, nice to feel part of it all even though I don't live in London. 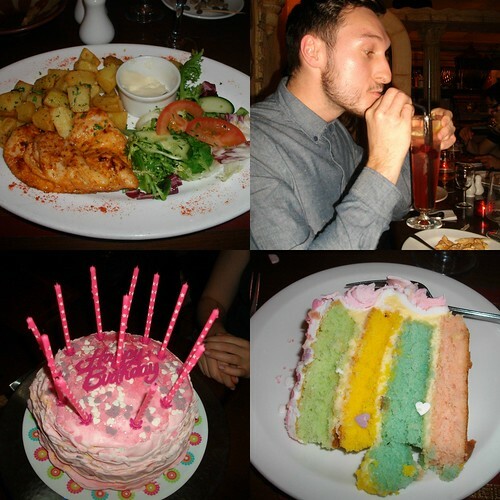 I had a mid week birthday meal with friends because a few of us have birthdays in the same week. 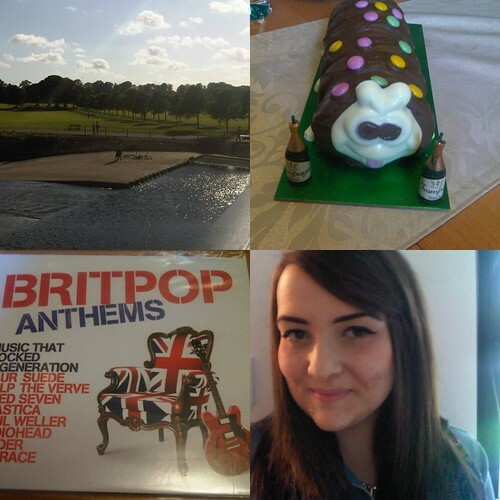 My friends know me very well and got me a caterpillar cake and Brit pop album. You can't beat a night in with the girls. I had a joint birthday celebration with my friends Jack and Harri on the weekend and we went for food at Mezza Luna which was a great little place on City Road in Cardiff. We had some Moroccan food and there was even a belly dancer, we all got roped into belly dancing but I have no rhythm at all so wont be taking that up as my new vocation. Emma made a ruffle icing, pastel layer cake masterpiece which tasted great, I think she should make me one every weekend. YUM. I went to see a band called Mowbird in my new favourite venue Gwdihw (Welsh for owl) and got some great shots on my instax camera. I ate even more cake, this time with some comedy 1D decoratoins which Rosie would appreciate. I tried out some IMpress nails which looked fab and were so easy too apply, great for a night out. I went to Bristol yesterday for the Bristol Bloggers Meetup that Kim and Steph organised, they did a geat job and it was good to see them again along with the lovely Lily, Hannah and Sammy. It was also lovely to meet some new people like Amie , Chloe Lee and Sophie. I always enjoy meet ups but get a little nervous and babble so I'm sorry if I went a little off topic. It was a great way to round off my my birthday week off. I wish all weeks could be like this! 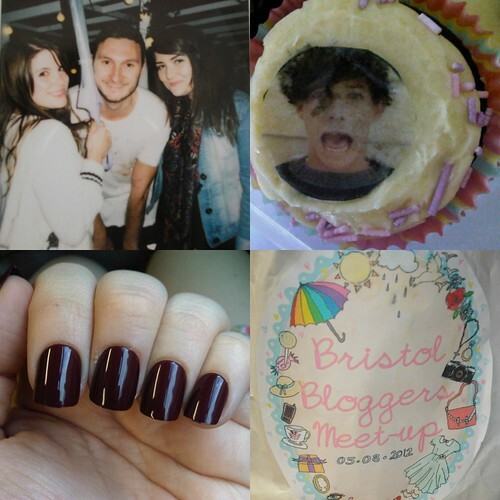 Sounds like a super amazing week :] the cake looks gorgeous. I wanted the chocolate face but my mate ate it, gutted! Wow sounds like a great week, Happy Happy Birthday. Caterpillar cake is the best, I always go for the piece with a white chocolate foot...mmm. So lovely to meet you hun! I loved our chat and the welsh cake was delicious! I'm glad you had such a lovely birthday miss :) the rainbow cake looks DIVINEEEEEEE hello cake craving haha. haha the best brows to have ;) Thanks! Wow sounds like you had an amazing birthday week, that cake looks AMAZING! I LOVE that nail colour - absolutely stunning! That cake also looks pretty good!